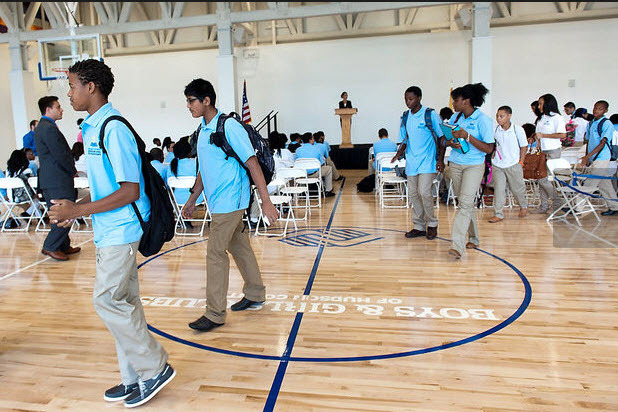 This morning 125 ninth-graders began a new chapter in education in Downtown Jersey City. Wednesday was opening day for the Great Futures Charter High School for the Sciences, a joint effort of the Boys and Girls Club of Hudson County and Jersey City Medical Center-Barnabas Health. “Our expectation for you is to be highly motivated,” Mary Jo Trusso-Sabbers, principal and chief academic officer of the school, told the students during an opening assembly. The school is located at 225 Morris Blvd. Downtown in a new building that also is the new location of the Boys & Girls Club of Hudson County. By the time these freshmen are seniors, their will be 500 students attending the school, said Gary Greenberg, executive director of the Boys & Girls Club of Hudson County. The new state-of-the-art building has science and technology labs, a music-recording studio, a learning kitchen, and new gymnasium, among other features. In addition to following a curriculum aligned with the common core state standards and New Jersey core curriculum content standards, students will have the opportunity to take courses in workplace certification programs in the health sciences. When students graduate, according to Valdes, they will have gained certification as either an EMT or medical assistant. This afternoon the ribbon will be cut on the new Boys and Girls Club building, with a special appearance by the Yankees CC Sabathia.